On US 1 SB just before entering Rhode Island, this is the beginning of what turns into US 1A in Rhode Island. 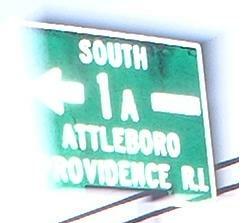 Here, of course, there are no shields, but further down, like at I-95 Exit 1, it's MA 1A just like the northern route. Why won't MassHighway cooperate with RIDOT? US 1 takes on several different personalities. 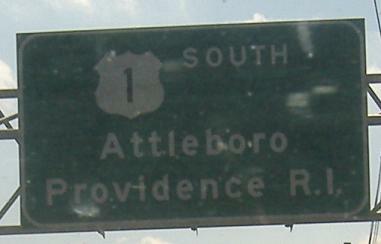 South of I-95 (old MA 128), it's a fairly busy surface road. North of there, you can either follow old US 1 or current US 1 onto I-93, but to get to I-93 US 1 NB briefly multiplexes with I-95 SB. This, of course, wasn't supposed to be the case with I-95 being completed into Boston, but then US 1 would have had an even longer multiplex with MA 128 NB (as it is, 128 now ends at I-93, though it only leaves I-95 to the north of Boston - the long plex is allowed because everyone calls it Route 128). US 1 and I-93 then run together for quite awhile, and pick up MA 3 between Quincy and the "Storrow Drive" exit (26). US 1 then leaves at Exit 26 and takes a wide loop underground, at what used to be a 3-Y into an elevated structure (see the I-93 page for more info). 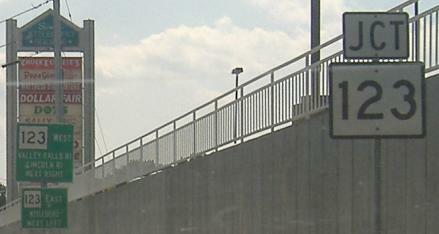 During and after crossing the Tobin Bridge, you are on the Northeast Expressway. If you're paying attention, you'll notice US 1 being signed TO I-95 across the bridge. I-95 was intended to come this way along with US 1; it would have joined US 1/MA 3 at I-93 Exit 18, another 3-Y, and I-93 would have begun where US 1/I-93 now split. Where the NE Expressway now ends in Lynn at MA 60, there are stubs and a significant length of clearing where I-95 would have been laid in to the east and north. Environmental concerns in the Saugus area (there's a big natural reserve there with a few lakes) prevented the completion of the highway, so US 1 has been upgraded to Jersey freeway between MA 60 and I-95 to compensate (unlimited access but no cross traffic). Back when this was supposed to be I-95, US 1 used the more southerly alignment of MA 1A, then came up MA 60 and continued on the aforementioned Jersey freeway. Between I-95's Exit 46 (just north of where 1 and 95/128 cross) and Exit 50 (just north of the MA 62 interchange), US 1 is still a fairly major highway, and runs parallel with its big brother, but north of there it's a surface road up into NH. 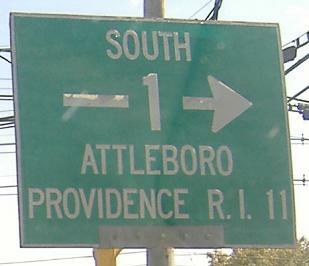 NB and SB just south of MA 120 (was RI 120), which is where the original Providence-Boston highway branches off as Washington St. 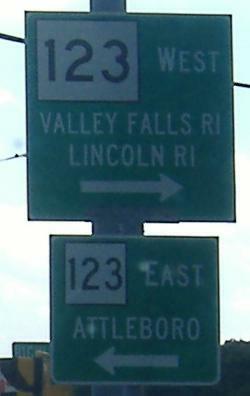 Note that North Attleborough has retained its original spelling, while Attleboro has adopted the abbreviated form, and the signs are spot on. MA 120 EB, same spot.